Langkawi is probably far from the top of people's lists tropical island destinations. I suspect that many people who know Bali, Phuket or Samui have never heard of this small Malaysian island. 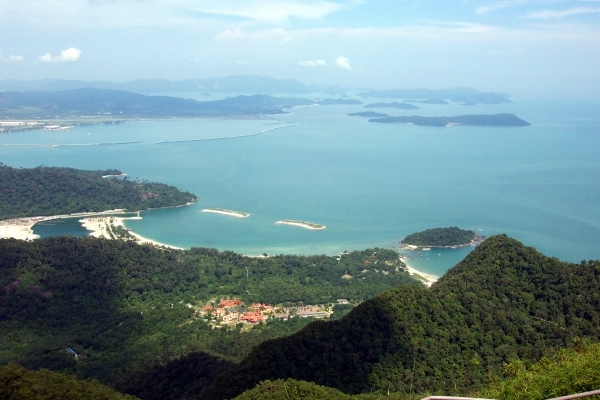 Yet Langkawi has some things to offer that these other destinations do not. Langkawi was still a rather sleepy island backwater up until the mid 1980's, when the island was made a duty-free port at the expense of Penang to the south. Millions of dollars then poured in to build new resorts and other tourist facilities. As with a lot of investments made around Asia in the late 1980's and early 1990's, some of the developments weren't well thought out and ran into trouble when the economic crises hit in 1997. As it happens, that might not have been such a bad thing. Things slowed down at the point where there are now some fabulous secluded resorts, yet there still remains an abundance of wildlife, which often pays a visit right into the hotels! Although recent efforts have been made to broaden Langkawi's appeal, the main attraction of the island, in my view, is that natural scenery. Most of the resorts are along the island's south coast, although a couple of 'super-luxe' properties have staked claims to the north coast. The island's main town is Kuah, in the southeast corner of the island. The main ferry terminal, where boats connecting the island to the mainland and Penang arrive and depart, is located at the south end of Kuah's harbor. Langkawi's international airport is located near Cenang beach in the middle of the south coast. Most of the island's resorts are located on Cenang beach and Tengah beach to the south. The western end of the south coast is home to several more resorts as well as several attractions, such as the Mount Mat Chinchang Cable Car.